Bedrooms: 1 double plus 2 further sleeping areas (1 twin, 1 single). Sleeps: 5. Forfar. Pets welcome. Short breaks. This 17th century stone cottage has a warm sensation of calmness: it lends itself both to peacefulness and activity. The surrounding countryside is geared for wildlife. The cottage and outbuildings hold ancient charm and the landscape, whatever the season, would captivate a painter. It has all the advantages of modern living and there are numerous local attractions such as Glamis Castle and plenty of choice for sports - golf, hill walking, fishing and skiing. There are lots of houses and flats to rent for 6 months or longer throughout Scotland but it can be difficult to find rental properties that suit all your requirements. If you are looking for a house to rent then there are many things to consider. The main ones for most people are of course location and price - but if you have pets (particularly cats or dogs) then it can be hard to find houses available to rent that allow pets. However they do exist so don't despair! Rented accommodation varies considerably but there are some excellent country houses to rent in rural Scotland and quality family houses to rent too. Many people chose to rent a house before they buy, particularly if they are relocating to Scotland and don't know exactly where they want to live - renting is a very good option so you don't rush into buying a house in the wrong location. Buy-to-let property has been a very popular form of investment in recent years and for renters this was good as the market became saturated with letting properties and hence the cost of renting came down. Things have of course changed with the recession and many of these rental properties have now been sold or are on the market. Most houses to rent in Scotland are let through a 6 month assured tenancy but of course many property owners are happy to rent for 12 months or longer to a good tenant and will just renew the tenancy agreement every 6 months. There are many legal requirements and responsibilities if you are a landlord and if you are renting your house for the first time make sure that you are familiar with them. Tenants need to ensure that they understand the Tenancy Agreement that they will have to sign before moving into the rented accommodation - it is always advisable to take legal advice. 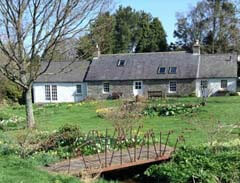 One of our former self-catering cottages is now available on a long let. It is a 3 bedroomed, isolated cottage on the shores of Loch Lomond - you have to walk the last mile and a half to the property so not suitable for everyone! If you want total peace and quiet, perhaps to write a book or paint a masterpiece, then this is a perfect long term rental house.